1. Approximately 80 % of the palate is covered with metal : difficult phonetic adaptation and decrease in taste. 2. The distal area of tooth 13 and 24 is compressed : risk of tissue inflammation. 3. The anterior part of the palate is covered : poor tissue stimulation by the tongue. 4. Difficult to reline the free saddle with a traditional design. 5. 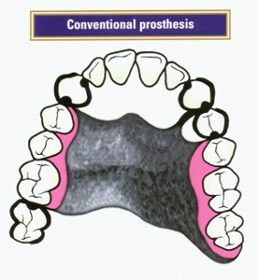 A conventional alloy with low elongation and a high Vickers hardness is used : low resistance to clasps fracturing and trauma to natural teeth. 1. 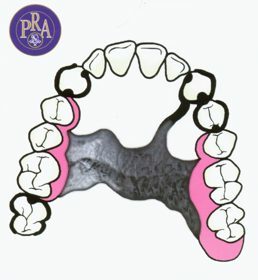 40% less metal with the PRA design : good phonetic adaptation and increased sensitivity in taste. 3. The anterior part of the palate is freed : excellent tissue stimulation by the tongue. 5. The Wironium alloy enriched with nitrogen has a high elongation and low Vickers hardness : high resistance to clasps fracturing and low abrasion on the natural teeth.